Kickstarter will be launching officially in Canada on September 9th. Canadians will be getting some new opportunities to flex their creativity in the near future. Whereas once residents of the northern nation had to jump through hoops to launch their projects on the popular crowdfunding site, it's been revealed that Kickstarter will shortly be making its official Canadian debut. Among the events planned to celebrate the site's arrival in the region are "Kickstarter Schools" in Toronto and Montreal that we can only assume will be tailored toward teaching prospective crowdfunders the ins and outs of the Kickstarter process. Ironically, these "schools" may be arguably less necessary now that Kickstarter is establishing a presence in the country. Previously, Canadian Kickstarter candidates had to go through the process of setting up an American shell company to start a funding campaign. By launching officially in Canada, that barrier to entry will presumably be removed, making the proceedings all the simpler going forward. 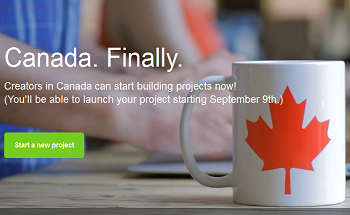 The official launch of Kickstarter Canada has been slated for September 9th. That being the case, impatient crowdfunders living in the region can start building projects now. Overall, it's hard to see the expansion of Kickstarter to another region as being anything other than good. In fact, if there's one thing we'd like to see it would be for the crowdfunding site to stretch its reach even further. Kickstarter's country selection page currently only includes three nations: the United States, United Kingdom and Canada. Granting that those countries encompass hundreds of millions of people, it's still a shame to think of the many projects that could benefit from Kickstarter in other regions around the world.